I was not able to find measurements for "standard bearings" from the Federal Mogul site you suggested. King bearings and one ebay seller did give their measurements. No surprise: They both had different measurements for "standard" size. No one else will tell the measurements. Seems so strange. Selling main bearings without giving the measurements? I don't get it, but I can tell that "standard" is not standard. I will take some time and see if any of the original bearings from the cracked block or my other cracked block will give me the proper clearances on this block. the 96full engine manual is here. just to see how crazy 9 bearings sizes are. the had way to precision grind any factory crank,ever. 1996 (off post one, this forum sticky, see page 6a, engine,,g16b are all the same. 6A1-46 Shows standard size.and up to page 50 ,on mains and the 9 codes. the only use of the above is stock worn cranks you read the above page and check your 4 journals for 9 possible sizes and check clearances. later one can grind the crank to suzuki spec and use suzuki bearings but now, the cant deliver them. but nobody does this now, for cost reasons and suzuki does not sell all sizes,now, discontinued, on many sizes so forget them. then the crank must be ground, .010 or .020 ( and then finished ground the exact size, in the data sheet from say king. the word standard has no meaning, on the king end, really but guess its the most loose suzuki standard 9 size. id you read the mogul data sheet it does spec out all bearing it sold 100%, ask them get it. but lets go there now,,, you do know that cranks can be sprayed with liquid hot iron and then ground to king,trw or fed mogul spec, right? same story on cams , for sure cams that are not to be found on earth now. after this they grind the crank to new standard, NOT japans metric, but to say Fed Moguls data sheet, PRECISION ground and polished. Japan is now out of the loop or picture, one is grinding the crank to USA bearing spec, Precision ground. the do not read the PDF above, at all, after the first bearing clearance measurements. if the clearances are wrong, the crank must be ground. and king/mogul/trw spec and bearing precision fit. AND NO you cant mix caps and make any of this work ever. step one, you mark all bearings as the come out, do not mix up any. 9 sizes just on mains, ok? 3: if it passes, then I have my crank polished, makes it stronger, and lubes better. 4:if fails the cranks is ground, to .010, if not clean, .020 inch undersized for over sized bearing matched. 5: new bearing fitted at time of grind, the bearings are perfect and crank is ground to this new perfection that suzuki could never do. at step 2, you might discover anything, even journals ground in the USA, and using USA bearing,so takes skill discovering this, and deciding what you have. using USA tooling and USA, bearing and imperial measurements ,not metric. as it was new. using uSA king/mogul,TRw real data sheets. to USA spec. that is how this is done. or find a 25 year old crank not worn out.good luck here. or plastigage it and say good enough and drive it like you stole it...,,, I will not judge this, it's your buggy. king diameter , 44.000 / 43.983 mm , cold not find a data sheet there. they have data sheet I can not find, showing the many sizes. each makes knows the crank was ground for sure. to as spec. no usa maker ,makes bearing for any stock crank. see why,? that gang grinding crude in the factory. as you can see they have inches and metric bearings, and the crank grinder uses the data sheet to get the exact grind. he orders the beariings opens the box and there must be a data sheet inside, showing and telling the grinder man what to do. the goal is.0008 to .001" CLEARANCE, 12 TO 6PM ON THE JOURNAL. THAT IS WHAT HE DOES. AT FULL MAIN CAP TORQUE AND ATTENDANT CRUSH. I will measure the rest of the main bores today and see what I can figure out. I have been studying hard and think I have my answers now. Machinist orders the bearings that are a little too big and then makes the crankshaft & housing bore fit the bearings. Still strange that bearing sellers do not always post the size info for their bearings. Anyway, after careful measuring I find that my crankshaft journals are all the same and within specs and not out of round. Also, all of my housing bores are exactly the same to within less than 0.0005". They are all just a tiny bit bigger than the biggest size in the service manual chart. After comparing carefully the 9 size combinations, I have decided that if I get the "yellow" bearings (all 5 the same) then they should work without having to do any machining to make them fit. Important to me because I don't have machine shop. Then I did a lot of online shopping (hours and hours). 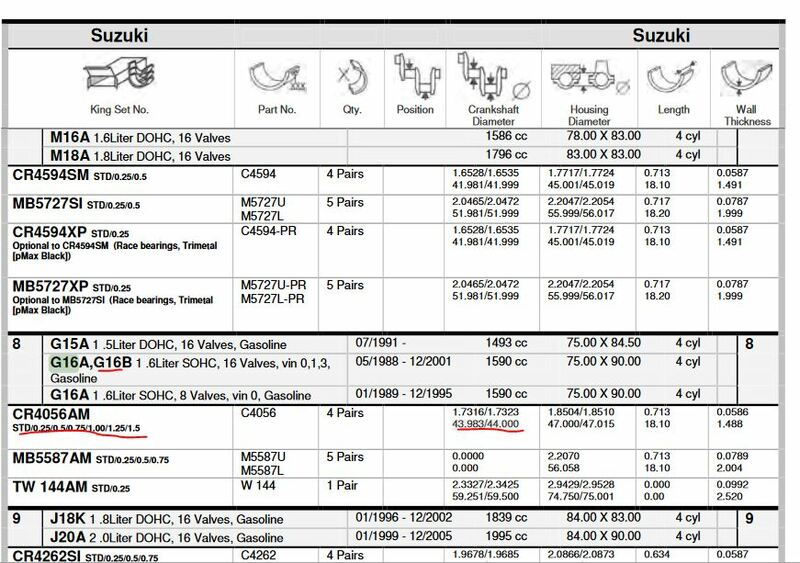 I found that Suzuki does still make the color coded bearings because they are used in a variety of engines on cars, boats, and motorcycles. Problem is that they changed the part numbers for these color coded bearings. Searching for main bearings does not work well, but searching for the part number does work well. The Suzuki color coded main bearing are sold individually (not in sets of 5). I will attach screenshot of my study notes along with my shopping notes. They might be useful to someone? ok the original bearings were lost and shell color codes lost with them but the crank has block stamp code for each main. so 1./2 the 3x3 code are known on all 4. mains. its much more easy to tell this then type, it. the big engine builders books cover all this. the suzuki bearings to not use the USA or European standards, at all and use suzuki only based on the silly wild inaccurate gang grinding machined. I may be useful but really now many stock cranks are not worn out or reground.? very very rare that. worst of all are cracks. cracks love to crack more, just like earth quake faults do, and is (later)both vibration causes but thermal cycling, that is why the are rejected out of hand.